As both a student living in my own place, an owner of two mischievous pets, a YouTuber and a B-Blogger, I rarely get the time to pamper myself. The main reason being that I don't have a bathtub I could soak my tired body in to revitalize, the second reason being that by the time I get ready for bed, exhaustion takes over and I pass out. 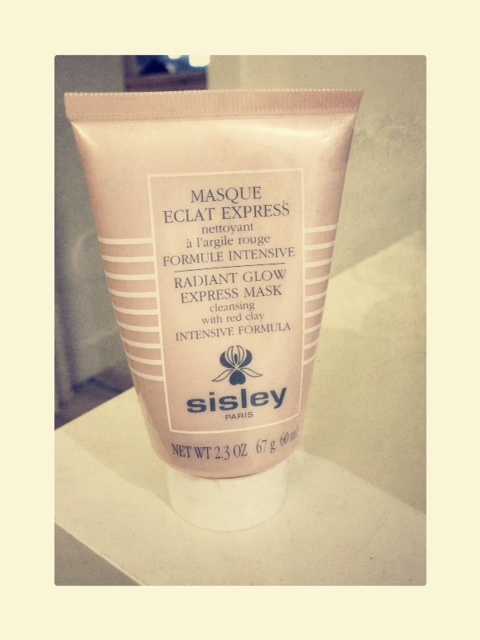 I have been trying this Sisley mask for a while now (2 months and a half months to be exact), meaning that it is finally time to review it and share with you my thoughts. The bottle says that this is a Radiant Glow Express cleansing mask with red clay and contains an "intensive formula". The consistency of this is rather like whipped cream. Soft in texture, and glides onto the skin like silk. "Combined with botanical extracts (carrot, red vine and rose-hip), and essential oils (Rosemary and Chamomile)" it helps to remove impurities and boost the skin, allowing it to cleanse thoroughly by absorbing excess oil and dirt. What I love about this mask, first and foremost, is how little time it takes. Sometimes, I do use the occasional sheetmask. But the thought of lying on my bed doing nothing for 30 minutes taunts me. I am long-sighted, so I cannot read a book without glasses, and obviously glasses on top of a sheet mask - it simply looks strange. I apply the mask all over my face (quite generously, despite the high price), and allow it to absorb for 3-5 minutes. I then wipe it off with a damp cotton pad, although it suggests you to rinse with lukewarm water. I find that by taking it off with a cotton pad, the remaining film of the product left on your skin helps overnight. I also love how the mask does not harden, like normal clay masks do. Personally, I dislike the tightening feeling on my skin, and the time and effort needed to rinse off clay masks after - it's a little too much effort needed from me. The mask remains silky and creamy on the skin by the time I wipe it off, leaving my skin hydrated and soothed. Honestly, I do not understand why I uploaded these two rather 'gaunt-looking' photos. The thought of showing my naked face does intimidate me slightly, so I thought a filter would make it look better. Only if you are someone who lacks sleep and time, otherwise I think there are cheaper options. Also if you have oily skin, you might want to try out a sample to see the effect of it the morning after as your skin may produce more oils than usual. I hope this was helpful to you. If you have tried this mask, please let me know your thoughts. I would love to hear them!